On this weekend's show, John Gonzalez and Amy Sherman broadcast from Grand Rapids to experience the Ford Museum and the Grand Rapids Brewing Company. They also check in with friends from Experience GR and the JW Marriott. This show aired Nov. 5-6, 2016. John and Amy talk to Joe Calvaruso, executive director of the Gerald R. Ford Foundation. 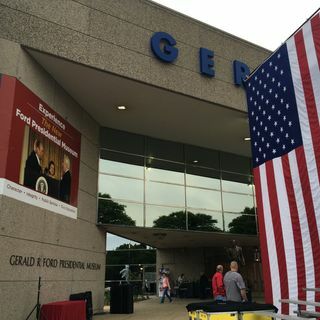 He talks ... Maggiori informazioni about the benefits of joining the foundation as a member, and he talks about some of new interactive technology and updates at the Gerald R. Ford Presidential Museum. John and Amy talk to Stephanie Kotschevar of Experience Grand Rapids, which is a great resource to all the things happening in the area. She talks about "Cocktail Week Grand Rapids" (Nov. 9-20), as well as the upcoming Grand Rapids International Wine, Beer & Food Festival at DeVos Place (Nov. 17-19). John and Amy talk to their foodie friend George Aquino, the vice president of Amway Hotel Corp. He oversees the Amway Grand Plaza Hotel, JW Marriott, the Downtown Courtyard in Grand Rapids, and even Peter Island Resort and Spa. He talks about why you want so stay at his properties and restaurants, as well as some of his other local favorites. *Nov. 11: Chris Knape also noted all HopCat locations -- as well as Stella's Lounge and GR Brewing Co. -- will offer a free meal for veterans and active duty military.